If you’re already a teacher, but want to see a world and change something in your life, teaching English abroad might be exactly for you. 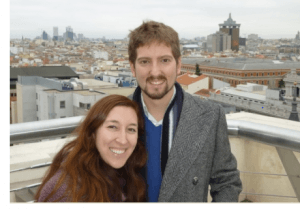 Two of our grads, Hitten and Shannon will tell their story of doing TEFL as a teacher. Hey! My name’s Hiten: and I’m a 25-year-old, passionate Londoner. I’m a Science teacher complete with deadpan humour and desperation to learn Spanish. After finishing a BSc in Neuroscience at the University of Bristol I took on the Teach First graduate scheme. Essentially I was placed in one of the bottom 5% of schools in the UK and expected to teach Science full time in addition to gaining a PGCE and a Master’s qualification in Educational Leadership. Suffice to say it was taxing (to say the least!). After this I moved back to London and loved it . . . but my feet got itchy. A two-month course of anti-fungal cream told me the problem wasn’t athlete’s foot. I figured it was time to take a bit of time out and for a few years now it had been on my mind to learn a second language. My school was decent but the way languages were taught at school left me cold. After finishing my GCSEs and getting a nominal A, the idea of ever learning a language lay dormant until the third year of university. I decided that if I was going to learn, I’d do it properly and all of the feedback I got from my teacher mates was that the best way to do it was immersion: going to the source of a language and learning directly. I researched a few places and one of the cities that constantly popped up was Madrid. Naturally! It’s the home of ‘Castellano’ Spanish, the most pure form of Spanish, as well as being an awesome city full of nightlife, culture and some of the friendliest natives I have ever come across. Now I live in an interesting neighbourhood called Lavapíes (Google it! ), teaching English, eating the vegetarian food that Lavapíes has to offer and enjoying the fine weather and relaxed pace of life that has become something of a cliché in Madrid. I love teaching—theory and practice. There are few things that make me as happy as a well-executed lesson where your students come out happier at the end. This made teaching English an obvious choice of job—I was also told that a TEFL qualification gives you automatic access to a growing job market in Spain, something that I have found to be true in practice. 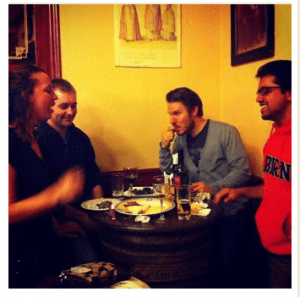 TtMadrid is an excellent place to get your TEFL certificate. I had come from a tough school so to say that my teaching style was authoritative is an understatement. 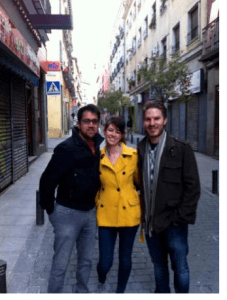 The one-month TEFL course is taxing and intensive; however the TtMadrid team that Natasha has put together was excellent for helping me make the necessary changes to my teaching style. John is incredibly driven and has an excellent knowledge of the basic tools to thrive as a teacher. Laura was incredibly supportive to those who need a little extra push and Megan went out of her way to provide me with information and tips to help me transition from being a teacher in a tough UK school to teaching English in Madrid. As well as this, the other staff at the school (Helen, Karmen and Lisette) helped me to find an apartment and settle into daily life, during and after the course. Short of offering me their organs, I’m not sure what more they could have done. Come to think of it, my left kidney does feel like its slowing down . . .
“Nooo!” They shout excitedly, shaking their heads rigorously. “Nooooo!” They laugh, glancing outside at the bright sunshine. “Who can tell me what the weather’s like today?” I ask, as hands shoot up into the air around me. I had always known I wanted to be a teacher, and absolutely loved my job teaching literature and writing to teenagers in the US. But after 3 years, I started to get the traveling itch. At 24, had I really found the job I was going to have for the rest of my life? Wasn’t part of the beauty of being a teacher that I could do it anywhere in the country . . . or the world? It didn’t help that a good friend had just moved to study and my fridge was covered with postcards of the fabulous places she had visited. I told myself that if I didn’t do it now I never would, and took to the internet to begin planning my move. With my experience as a classroom teacher, I knew I didn’t want to be just a teacher’s assistant, which would be the case in many of the programs I looked at. I wanted the freedom to plan my own creative lessons, the authority of my own classroom, and help tailoring my skills to an ESL environment. Researching TtMadrid, it seemed that they could give me the skills I lacked and help me find the job I was looking for. I initially expected the course to be a breeze; I already knew how to lesson plan! But during the teaching practices I quickly discovered my biggest challenge as a second language teacher: I talk too much! I was so used to narrating” my lessons, explaining “Today we are going to talk about the weather. The weather can be rainy, cloudy, sunny, windy, or snowy. We are going to use paper plates to draw the different types of weather.” The TEFL course taught me to jump right into activities and use modeling and extremely precise language to get my point across. I even learned an entirely new way to structure my lesson plans that was better suited to English language learners. Now I work in a Spanish kindergarten, teaching English, playing games, and singing songs with four-to-six-year-olds. What I love most about teaching is that every day is different: one minute I’m dancing the hokey pokey as we learn parts of the body, the next handing out medals during the Knowledge Olympics, or roaming the classroom in our animal masks finding ways to use our five senses. I met my boyfriend, Luis, on a hiking trip in the beautiful countryside just outside, and after two years here I still don’t feel that traveling itch to leave.